Commander, Combined Task Force 152, Kuwaiti Brigadier General Jassim Mohammed Al-Anari, left, talks with Capt. 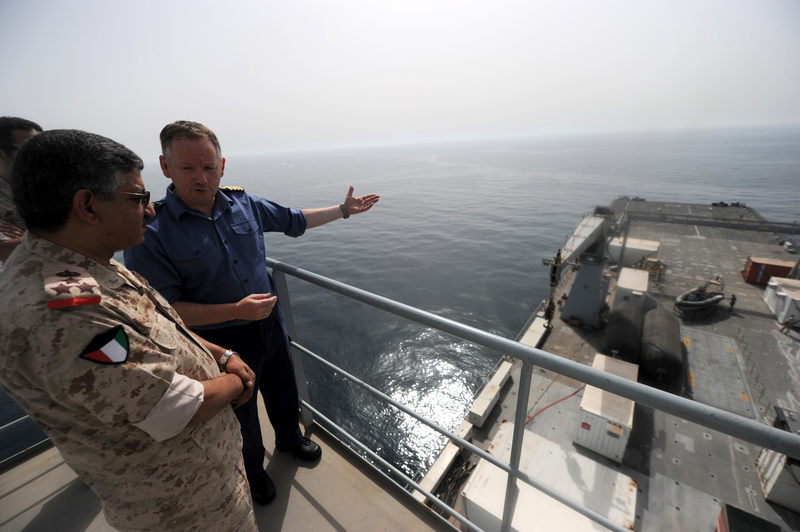 Gerry Patterson, commanding officer of British Royal Fleet Auxiliary landing ship dock RFA Cardigan Bay (L3009) during a tour of the vessel at the completion of maritime evolution Stakenet 10-2 in the Arabian Gulf. Stakenet 10-2 was a maritime infrastructure protection evolution hosted by Combined Task Force 152 in conjunction with regional navies and coast guards, to further develop regional capacity within its member nations for protection of key economic and energy related maritime infrastructures. (U.S. Navy photo by Mass Communication Specialist 2nd Class Ja'lon A. Commander, Combined Task Force (CTF) 152, and several international and regional navies and coast guards, successfully completed Stakenet, a maritime infrastructure protection evolution in the North Arabian Gulf July 11 – 14. This year’s Stakenet included approximately 14 vessels and support from the Kuwait Navy and Coast Guard, United Arab Emirates, Kingdom of Saudi Arabia, Qatar, France, United Kingdom and United States. It was the third evolution in a series of maritime engagements designed to exercise the establishment of local sea control to protect key economic and energy related maritime infrastructure. Stakenet also demonstrated the ability of multi-national navies and coast guards to communicate effectively while overcoming language barriers, and their ability to enhance cooperation between different nations that use different operating procedures. This type of deliberate and collaborative engagement is characteristic of the CTF 152 mission, and further illustrates the Kuwaiti military’s professionalism and aptitude as a regional naval power. “As a result of this evolution we proved a coalition force can quickly establish local sea control, and more importantly we learned to work more effectively with our regional partners,” explained Kuwaiti Brigadier General Jassim Mohammed Al-Ansari, Commander CTF 152. Combined Maritime Forces is comprised of three task forces operating in the region: CTF 150 focuses on counter-terrorism and maritime security operation outside the Arabian Gulf; CTF-151 is the counter-piracy task force and CTF-152 focuses on maritime security and infrastructure protection inside the Arabian Gulf. There are 24 nations currently supporting the CMF mission covering more than 2.5 million square miles of international waters to conduct both integrated and coordinated operations. CMF is committed to increasing the security and prosperity of the region by working together for a better future. Maritime evolutions, such as Stakenet further assist CMF and its partner nations to develop regional capacity to protect international waterways.